Top: Associate Professor Helen Abud and Professor Jose Polo. Bottom: Dr Thierry Jarde and Dr Anja Knaupp. Stem Cells Australia (SCA) has produced videos of eight Australian labs heads who are using stem cells in their research, showcasing the important discoveries that are being made in the lab. 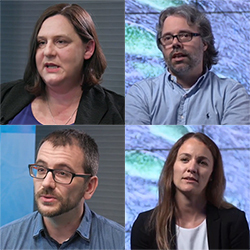 Two Monash BDI stem cell experts, Associate Professor Helen Abud and Professor Jose Polo, have been featured, along with two of their research fellows, Dr Thierry Jarde and Dr Anja Knaupp. They share insight into their research, how they began their careers and what excites them about their work. Watch Associate Professor Abud's video here, and Professor Polo's here.